The story below is a compilation of stories relating to the February 2018 corporate reporting season in Australia, published between late January and early March. Attached is FNArena's final balance for the season. The February corporate reporting season in Australia takes place against a background of global equities going through a 'Risk Off' phase with Wall Street correcting from dizzying highs, and the rest of the world unable to escape gravity, even when the Australian share market has seldom been able to match the performance of its offshore peers post 2009, let alone over the year past. C'est la vie, say the old folks; just goes to show one never can tell the exact outcome when forced selling and herd behaviour push rational decision making out the door. Assuming corporate performances will still count this month, many a market strategist is expecting a generally solid performance from Australian companies. The fact that confession season ahead of February has been rather quiet, plus ongoing strong economic momentum just about everywhere around the globe feed into expectations that this month more companies will be able to outdo analysts' forecasts. This optimism in particular applies to resources companies where expectations have been steadily building on the back of stronger-for-longer commodity prices, and now analysts are looking forward to more capital management in the form of extended payouts and share buybacks from, especially, bulk commodity producers including Rio Tinto ((RIO)), BHP Billiton ((BHP)), Whitehaven Coal ((WHC)), Fortescue Metals ((FMG)), and a number of others. Adding to the underlying bullish undertone is the fact that earnings forecasts for ASX200 companies have been rising over the months past, which is generally seen as a positive signal. As was the case throughout 2017, the bulk of earnings forecasts upgrades comes from resources stocks. Ex-resources, the picture looks a lot more benign (but positive, nevertheless). On average, Australian profits are forecast to grow by 7-8% this financial year, with upside bias depending on how much exactly miners and energy producers can add into the mix. This is a marked slow down from the 17% EPS growth achieved in FY17. It is also markedly lower than the 14% that is being forecast internationally. Thus, Australia is seen as remaining a laggard, internationally, but there remains support from a resilient housing market, benign growth in consumer spending, plus the global uptick in economic momentum. Over the past few months, consensus earnings momentum has specifically improved for healthcare companies, diversified financials and utilities but deteriorated for insurers, telecom companies and retailers. Since reporting season is all about expectations and whether they have been appropriately priced in, and how company results compare, there will always be expert voices that see dangers and threats in the former group and potential for opportunities in the latter sectors. Quite a few analysts have expressed their doubt whether high growth, high PE companies will be able to meet lofty market expectations. On the other side of the coin, a number now sees potential for an upside surprise from Telstra ((TLS)), Coca-Cola Amatil ((CCL)), AMP ltd ((AMP)), Woolworths ((WOW)), Origin Energy ((ORG)), and various other large cap companies. Could the market finally have become too bearish on Vocus Communications ((VOC))? Sometimes expectations can fall low enough ahead of results, making it a lot easier for management teams to come out on top vis a vis market sceptics. But there are never guarantees. Amcor ((AMC)) is one stock that is dividing the analyst community ahead of its result. Those with a positive view suggest the mild profit warning issued last year has triggered a re-basing, creating a platform to now return to business as usual. There are others though who sense it may have been a precursor to more bad news through a lowering of the FY guidance when the interim report is released. In similar fashion, there seem to be risks regarding margin pressure at Challenger Financial ((CFG)), and slower execution at NextDC ((NXT)), Domino's Pizza ((DMP)) and Lend Lease ((LLC)), but all these stocks equally attract positive views elsewhere. Other divisive stocks include Insurance Australia Group ((IAG)), Computershare ((CPU)), and Seek ((SEK)). Companies that feature high on analysts' lists for potential negative surprises include Healthscope ((HSO)), Primary Health Care ((PRY)), Regis Healthcare ((REG)), Silver Chef ((SIV)), Cabcharge Australia ((CAB)), GBST ((GBT)), Crown ((CWN)), and Retail Food Group ((RFG)). Ardent Leisure ((AAD)) was widely nominated as well, and that has been proven correct. Citi continues to see danger surrounding Event Hospitality and Entertainment ((EVT)) and Village Roadshow ((VRL)). Internal instability at Domain Group ((DMG)) is also feeding market expectations for a (potentially) disappointing market update. Every reporting season, or so it seems, there is one analyst somewhere who believes InvoCare ((IVC)) is going to miss market expectations badly. This February is no exception. One day, maybe. Amongst those nominated for likely positive surprises are Altium ((ALU)), Ausdrill ((ASL)), Bingo Industries ((BIN)), Boral ((BLD)), Cleanaway Waste Management ((CWY)), Corporate Travel ((CTD)), Link Administration ((LNK)), Megaport ((MP1)), Perpetual ((PPT), Reliance Worldwide ((RWC)), Star Entertainment ((SGR)), and Webjet ((WEB)). One of the sectors poised for some upbeat reports looks to be good old fashioned free-to-air TV with indications the sector has enjoyed a reasonably strong six months, while radio seems to be doing better as well. Citi analysts do not believe this revival in operational momentum is sustainable. The analysts think the market will thus zoom in on how well companies such as Nine Entertainment ((NEC)) are managing to keep cost growth under control. Outdoor media continues to grab market share, but here the picture remains clouded because of contract losses for APN Outdoor ((APO)) and HT&E ((HT1)). oOh!media ((OML)) in particular is expected to release a strong performance. The stand-out sector nominated for upside surprises is the local retail industry with analysts, on average, positive about JB Hi-Fi ((JBH)) and Harvey Norman ((HVN)). UBS even nominates The Reject Shop ((TRS))! Nobody mentions Myer ((MYR)), except in a negative sense. One stock that is broadly being associated with retail, but incorrectly as far as I am concerned, is Bapcor ((BAP)). Most analysts covering the stock see but positives on the horizon, irrespective of market scepticism. Nick Scali (NCK)), on the other hand, is steadfastly supported by lofty expectations. It's result this week probably deserves the rating "not bad". As per usual, FNArena will keep a close eye on changes and opinions during reporting season, with daily updates available through The Australian Broker Call Report and Stock Analysis. From this month onwards, the service has been enriched with a dedicated and permanent Reporting Season Monitor on the website. Also, Weekly Ratings, Targets, Forecast Changes, updated and published every Monday morning, keeps track of ratings, price targets and changes to earnings forecasts on a weekly basis. Late addition on Thursday morning: Macquarie analysts released their Highest Conviction forecasts prior the February reporting season. For an upside surprise they nominate Monadelphous ((MND)), Reliance Worldwide, Boral, AUB Group ((AUB)) and Nine Entertainment. Two companies are named for a negative surprise: Cromwell Property Group ((CMW)) and Myer. We are past the mid point of the month, but we've only seen the tip of the iceberg that is local reporting season in February. As I write today's update, less than 100 companies covered by the eight stockbrokers in the FNArena universe have updated and triggered an analyst response so far. By early March that total will have surged past 300. With the bulk of companies still in the queue, among them many market darlings and large cap, blue chip names, it's dangerous to try to identify solid trends. History shows the dominant narrative for this reporting season can still make a decisive turn from here, and it probably will. Finding this year's narrative is not made any easier for investors with strong macro stories impacting on a daily basis, ranging from Chinese holidays, to American protectionism, to US bond yields and fear of inflation, not to mention derivatives uncertainty. At micro level, there is one observation that stands out: the general optimism that had characterised local previews in January has noticeably disappeared with the opening weeks of February delivering a rather mixed bag, not the bias towards strong performances that was expected. The status operandi so far is probably best illustrated through the percentages in beats and misses recorded to date. While 35% of companies beating expectations is near the highest level recorded by FNArena, so is the near 30% in misses. It's a polarised market with companies operating in multi-speed segments of both the local and offshore economies, to say the least, on top of ongoing disruption and technology evolutions taking place. Before I move on to one particular potential reason behind the share market's bifurcation, let's have a quick look at what some of the other experts have to say. Market strategists at Citi believe underlying the trend remains positive, albeit skewed towards specific sectors that are enjoying better operational dynamics. Outside of resources, such sectors would seem to include diversified financials, energy utilities, medical products and infrastructure exposures. Think companies including Macquarie Group ((MQG)), Computershare ((CPU)), ResMed ((RMD)) and CSL ((CSL)). Sectors gripped by headwinds include banking, telecommunication, and retailing. All in all, Citi observes average growth projections are rising; mostly with resources companies in the drivers seat. 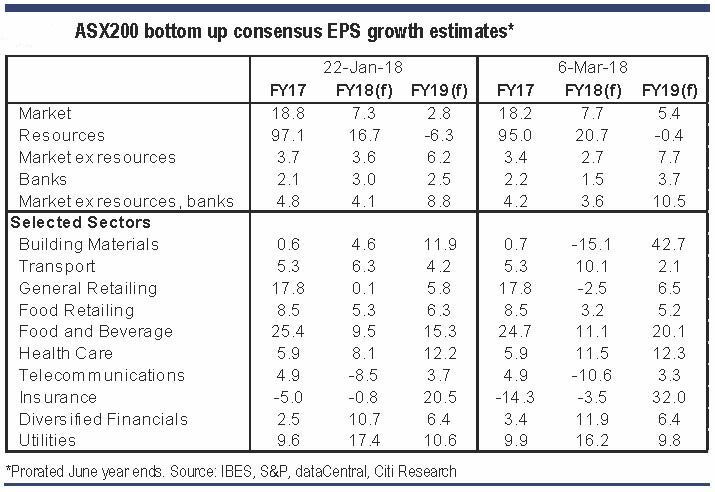 Irrespective, on Citi's observation, upgrades and downgrades to FY18 profit estimates have to date remained relatively equal. What most pleases Citi strategists is the absence of major calamities and full-on disaster announcements; this is in-line with an overall quiet confession season beforehand. Market strategists at Credit Suisse are among the most bullish in the market, and they make sure their analyses find their way to Fairfax journalists, hence why the initial assessment in the Australian Financial Review tends to have an equally bullish undertone. Regardless, Credit Suisse finds overall statistics to date have been skewed unfairly by just a few bad apples, identified as CommBank ((CBA)), Fletcher Building ((FBU)), and Wesfarmers ((WES)). This explains the title above their preliminary update: Not as shabby as it first seems. Dividends and new buybacks are surprising to the upside, considered evidence of a "solid underlying tone" for Australian companies. Upgrades to growth expectations continue to underperform those in the past, but for CS strategists this implies FY19 forecasts are probably due a catch-up. And whereas rising business investment proved the outstanding feature of last year's August reporting season, this year's upgrades are less eye-catching, acknowledge the strategists, plus they are more concentrated inside commodities. What needs to be taken into account is that most strategists assess results and outcomes in line with stocks covered by that particular stockbroker. The combination JPMorgan/Ord Minnett covers more smaller caps, which might explain why their intermediate assessment is putting the emphasis on the large number of "misses"; on Ord Minnett's counting no less than 43% of companies having reported by last week had failed to meet expectations. IT and industrials take the honours on the positive side, according to the broker, while consumer discretionary shines on the dark side. Ord Minnett also observes many weaker-than-expected growth achievements stem from offshore growth companies, with CSL highlighted as one major exception. In case anyone still has to catch up on the newest addition to the FNArena website; we now operate a permanent, whole-year-around Results Reporting Monitor for Australian companies featuring in excess of 400 companies covered by eight major stockbrokerages. Given we monitor eight stock universes against consensus projections with an intelligent human approach, we might just be providing the most accurate market wide assessment that is available. No euphoria, thus, and a rather polarised corporate sector where not everyone seems to be enjoying joyous conditions from global synchronised growth and still loose monetary conditions. Impacting factors remain tech disruption and increased competition from online, while accumulating stress on Australian households should not be ignored either. One factor that is not getting any attention is a possible slow down in the Australian economy. Probably because everybody is so focused on US inflation and rising global bond yields, and what this means for the RBA. To get a more timely insight into how the Australian economy is performing, Credit Suisse quant analysts have constructed what they call a "real-time activity tracker". The name says it all. It combines trend retail sales growth derived from stats published by the Australian Bureau of Statistics with sentiment and confidence signals from the Westpac consumer survey, combined with building and infrastructure spending data, as well as commodity price inflation from the RBA. The idea is to have a good indication before everybody else catches up with delayed releases of various surveys and updates by the ABS and others. 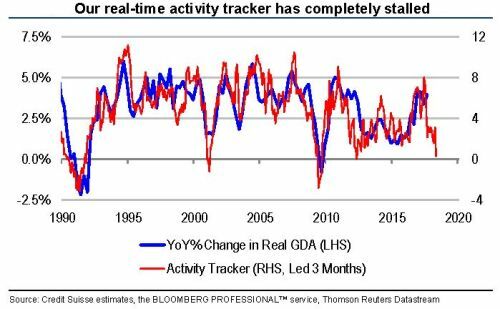 On the team's assessment, the CS real-time tracker leads real Gross Domestic Activity – a blend of production (GDP) and income (GDI) concepts – by roughly three months. The reason as to why this instrument deserves investor attention is because it is currently falling off a cliff (see below). The quant team at Credit Suisse finds vindication in recent labour market updates, as they showed hours worked fell noticeably ("sharply" in their wording) in both December and January. A slowing in NSW, the most infrastructure- and housing-intensive state, has been quite noticeable, the analysts point out. What this means is that any suggestion about the RBA hiking the cash rate is premature at best. At worst, it could wreak havoc in an economy as polarised as is Australia's. At the very least, suggest the analysts, one would have to conclude there is a mismatch between the bond market anticipating rate hikes from later in the year onwards, and what seems to be growth momentum slowing. Bottom line: the quant analysts think investors should not let themselves be blindsided by what is apparently being suggested by a large number of economists and the local bond market. Might be a good plan to go contrarian, and prepare for a more bearish scenario, suggests the team. Quality exposures in the share market should outperform in case the activity tracker at Credit Suisse proves spot on. Those familiar with my concept of All-Weather Performers will find there is a lot of overlap as most of the names selected would qualify under the quality label. While overall consumption indicators remain soft in Australia, there is also a slowing in business capex intentions. But what seems to have alerted CS's quant team most is the sharp deterioration in forward indicators of residential building activity. As they observe: "Building approvals collapsed in December, with apartment approvals falling particularly sharply. Approvals are now running below completion levels, consistent with weakness in demand and prices." Perhaps, the team offers, perhaps the Australian economy is merely navigating a temporary soft patch. But what if it's not? To be continued, albeit not next week. P.S. Citi has added Newcrest Mining ((NCM)) to its list of Conviction Buys in Australia. What is the most important focus for share market portfolios? Is it growth? Is it disruption? Most commentators and professional investors have argued the former since the middle of 2016. I have been advocating the latter since 2015. Maybe it's not a case of either this or that. Warren Buffett, in his recent annual missive to Berkshire Hathaway shareholders, and to investors across the globe, tried his best to dismiss rather simplistic labeling such as "value" and "growth". Good investing, Buffett argues, implies both are connected at the hip. I'd argue the same applies to growth and technological innovation, which is what causes the disruption in many of today's industries. If the February reporting season in Australia has proved one thing, it is that for successful investing in the Australian share market, growth and disruption are best seen as co-joined twins connected at the hip. "Value", as defined by forward looking Price Earnings (PE) multiples, more often than not confused investors, and proved them terribly wrong on numerous occasions. February 2018 was the reporting season in which High PE market darlings significantly outperformed their lower priced peers, with their financial results outperforming market expectations, forcing analysts to increase forecasts, and share price valuations – often by double digit percentages. The pain for shorters, and for many other investors who found themselves on the wrong side of the trade, was extra confronting since it had become a popular view that inflation is coming, interest rates and bond yields are on the way up, and high PE stocks should be avoided for risk of de-rating. Yet the exact opposite happened in February, despite the fact the month opened with increased volatility and selling pressure as the world watched US bond yields lift and anti-volatility derivatives implode. Best performing sector for the month, by a long stretch? Healthcare, led by High PE outperformers CSL ((CSL)) and Cochlear ((COH)). Information Technology (IT) also proved a stand-out, equally led by High PE outperformers Computershare ((CPU)), REA Group ((REA)), NextDC ((NXT)), Altium ((ALU)), and numerous others. [Note: I do not agree with the inclusion of Computershare, REA Group and NextDC, but the IT sector index promoted by the ASX does include these names, as well as Domain Holdings. Hence for the sake of simplicity, I'll just stick by it for the purpose of this review]. On the other end of the spectrum, cheap looking out-of-favour stalwarts such as Harvey Norman ((HVN)), QBE Insurance ((QBE)), Myer Holdings ((MYR)), Vocus Communications ((VOC)), IPH ltd ((IPH)), Asaleo Care ((AHY)) and iSentia ((ISD)) simply continued their bad news cycle, and share prices are sharply lower in the aftermath of yet more disappointing financial results. One should never forget, in the short term, reporting season is all about market expectations and how the financial performances that are being released compare to those expectations. Hence, immediate share price responses are not always an accurate indicator of what follows next. One relationship is direct and undeniable: if analysts are forced to upgrade or downgrade their forecasts and valuations, the share price virtually always follows suit, unless the price is already accounting for it. The stand-out example this February was delivered by a2 Milk ((A2M)) with many an expert adopting a cautious approach beforehand given the share price had quadrupled over the prior twelve months. But since January 1st, a2 Milk shares are up more than 40% (not a typo) and most of these gains have occurred on the day the company released its interim financials. FNArena subscribers can observe via Stock Analysis on the website how earnings forecasts and stockbroker valuations equally jumped higher since that day. Today, consensus target sits double digit percentage above a sideways moving share price. Seen through the prism of stockbroking analysts expectations, February 2018 delivered one of the best reporting seasons for corporate Australia over the past five years. FNArena statistics are not definitive as yet, but on our assessment some 37% of 318 reporting companies throughout the season have clearly beaten market expectations. This is equal the highest percentage with February 2016. Back then, 21% of reporting companies disappointed. This time around profit misses represent 25% of all released results. The average increase in price target of 4% is well above average, but still beaten by two 5%+ increases respectively in February 2014 and February 2015. Changes in recommendations throughout the season favoured upgrades above downgrades; 87 versus 54. Only one other reporting season had more upgrades than downgrades. In August 2015 the ratio stood at 116 up versus 40 down. -Earnings estimates usually decline by the end of most reporting seasons, but most brokers report the opposite happened this February. Average profit growth sits around 6-7%, which is reasonable yet below double digit growth in 2017, as well as double digit growth internationally. On a relative basis, Australia remains a laggard, as illustrated by the table below taken from a recent market update by UBS. -Positive surprises include capital management and dividends, with the added observation that a lot remains dependent on mining companies enjoying higher for longer prices, while boards remains hesitant to start investing in new production capacity. Analysts have noted a renewed appetite for corporate action, but also that cost growth is making a come-back. This kept numerous market updates by resources companies rather underwhelming, despite the apparent buoyant global conditions. –Margins are near cyclical peaks, and now coming under pressure as costs are rising, but top line growth in general is positive and companies seem to be positioning for additional investment, backed by positive outlooks and guidances. Note all of Woodside Petroleum ((WPL)), Newcrest Mining ((NCM)), South32 ((S32)), Evolution Mining ((EVN)), OZ Minerals ((OZL)), Sandfire Resources ((SFR)) either announced new transactions during the season, or their management teams indicated they are ready to pounce whenever opportunity presents itself. –Stand-out performances were delivered by a2 Milk, Altium ((ALU)), Appen ((APX)), BlueScope Steel ((BSL)), Bravura Solutions ((BVS)), Breville Group ((BRG)), Corporate Travel ((CTD)), Costa Group ((CGC)), CSL, Flight Centre ((FLT)), Hansen Technologies ((HSN)), Insurance Australia Group ((IAG)), Kogan ((KGN)), Moelis Australia ((MOE)), NextDC ((NXT)), Nine Entertainment ((NEC)), Orora ((ORA)), Qantas ((QAN)), Reliance Worldwide ((RWC)), ResMed ((RMD)), Seven West Media ((SVW)), Smartgroup Corp ((SIQ)), and Webjet ((WEB)). –Notable disappointments include Blackmores ((BKL)), BWX ltd ((BWX)), Domino's Pizza ((DMP)), Harvey Norman ((HVN)), InvoCare ((IVC)), IPH ltd, iSentia, JB Hi-Fi ((JBH)), Mayne Pharma ((MYX)), QBE Insurance, Vocus Communications, Ramsay Health Care ((RHC)), Silver Chef ((SIV)), Star Entertainment ((SGR)), Suncorp ((SUN)), Super Retail ((SUL)), Tabcorp ((TAH)), and WiseTech Global ((WTC)). –Resources' report card was rather mixed, as illustrated by the fact BHP ((BHP)) disappointed and Rio Tinto ((RIO)) broadly met expectations, including extra capital for shareholders through additional buyback and higher dividend. But Origin Energy ((ORG)) is oft cited as one notable outperformer for the sector, as is Mineral Resources ((MIN)). Notable disappointers for the sector include Beadell Resources ((BDR)), Dacian Gold ((DCN)), Northern Star ((NST)), Perseus Mining ((PRU)), Santos ((STO)), Senex Energy ((SXY)), South32, and Western Areas ((WSA)). 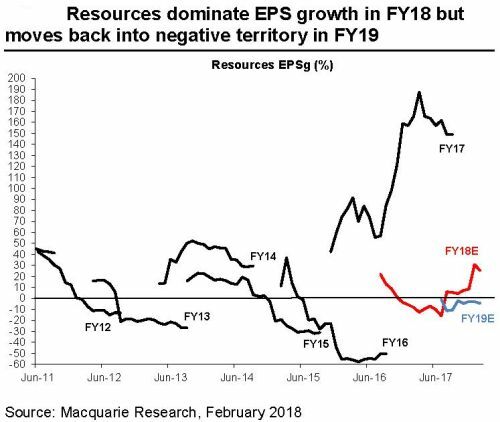 Earnings forecasts for resources stocks have fallen after rising strongly late in 2017, but they remain negative for 2019. –Travel stocks, from Corporate Travel to Qantas, including Flight Centre, Helloworld ((HLO)) and Webjet, defied market scepticism about lower prices and margin pressure in Asia and a direct link to consumer spending in Australia. –The retail sector proved a hotch-potch of solid momentum and sorry disappointments, mixed with plain disasters. AfterPay Touch ((APT)), Kogan, Breville Group, Lovisa ((LOV)) and Noni B ((NBL)) are clearly performing well. Harvey Norman, JB Hi-Fi, Myer, Michael Hill, and many others not so. The jury remains out for Accent Group ((AX1)) which might have benefited from expectations having fallen too low. A factor that might also have benefited Coca-Cola Amatil ((CCL)), as well as The Reject Shop ((TRS)). A weak result was delivered by Westfield ((WFD)), with questions being raised as to how this might potentially impact on the proposed acquisition by Unibail-Rodamco. For investors here lies a much broader question waiting to be answered: how does Westfield's rapid deterioration impact on Scentre Group ((SCG)) and other supermarket owners elsewhere? What does it tell us about changing patterns for consumer spending in general? -February also marked a come-back for traditional media on the back of advertising dollars flowing away from the Internet and from social media platforms. If sustained, this would mark an important reversal which should have the attention of all investors. Amongst those jumping back to life, after a prolonged period in the penalty corner, are 3P Learning ((3PL)), Ardent Leisure ((AAD)), and Village Roadshow ((VRL)). -In terms of ongoing potential for capital management, Qantas and resources giants BHP and Rio Tinto remain prime candidates, as are Crown Resorts ((CWN)), GWA Group ((GWA)), Inghams Group ((ING)), Investa Office Fund ((IOF)), Stockland ((SGP)), Wesfarmers ((WES)) and Woolworths ((WOW)). Analysis of past reporting seasons suggests those who manage to deliver a positive market beat are most likely to continue enjoying positive momentum for up to three months after their results. Whether this also applies post February is an intriguing proposition given many a fund manager is afraid of equities de-rating on the back of rising bond yields, and is positioned in accordance with this concern. Similarly, those who fail to meet market expectations might find a lack of buyer's appetite for a while longer. In broad terms, the Australian share market outperformed international markets in February, but it still clocked a small net loss for the second month in a row. Investors with exposure to outperforming small and mid-cap companies (see above) might have had a different experience. FNArena's All-Weather Model Portfolio experienced its best reporting season since inception in late 2014. 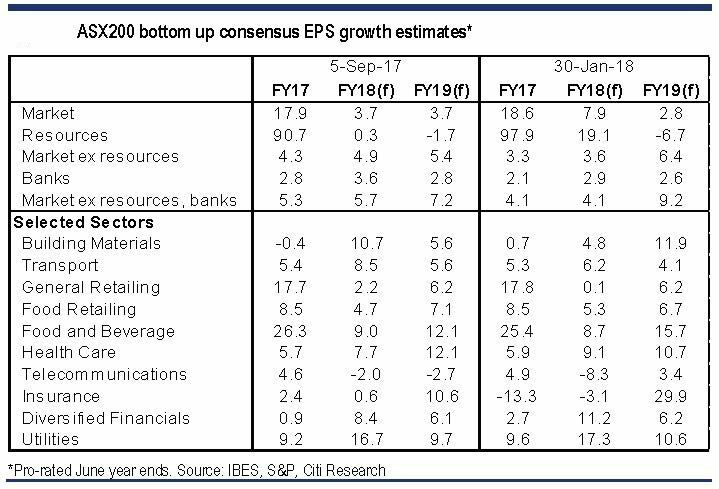 In terms of profit expectations, large cap companies ex-banks and ex-resources are expected to grow by between 5-8% in both FY18 and FY19. Expectations for small and midcap industrials are twice as high. 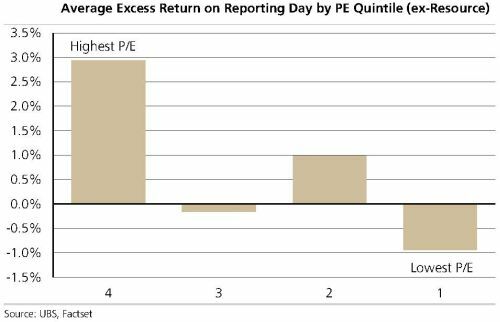 While some might argue this is already reflected in relative valuations, the February reporting season has shown that PE ratios, when judged at face value and in a static format, can be quite the misleading tool. In terms of "growth" versus "disruption", I think the connection is there for everyone to see. While growth might falter or slow down, I don't think disruption will. February has shown even long-time reliable growth stocks Ramsay Health Care and InvoCare are now finding the going a lot tougher than used to be the case. Whether this fundamentally changes the outlook for the years ahead remains to be seen. Investors looking for cheap value among the downtrodden might want to reconsider before jumping on board the likes of Retail Food Group ((RFG)) and Silver Chef with February updates revealing risks are plenty and elevated with a cheap looking share price not necessarily the best gauge available. Against a background of firm global economic momentum, epitomised by headlines such as "Strongest growth predicted since global financial crisis" (AFR), the February reporting season in Australia did not disappoint. Contrary to previous years when every season generated at least a few shock updates from household names such as BHP, Woolworths and Telstra, overall sentiment leaned towards the positive side and there were no real shockers delivered unless by companies we already knew were facing tougher times. I very much doubt whether anyone was genuinely surprised to hear about yet another corpse discovery inside QBE Insurance ((QBE)), or that Harvey Norman's ((HVN)) franchisees needed a lot extra support from head office. 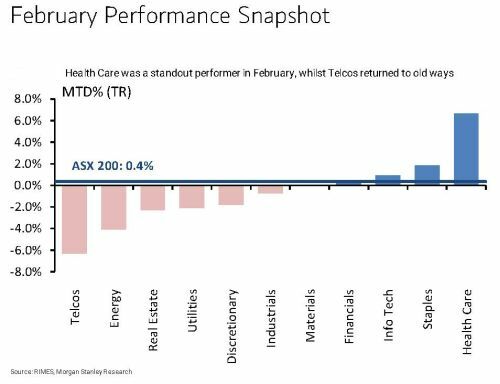 There are always companies that miss the mark, of course, and faster growing mid-cap industrials undoubtedly stole the show in February, but the big end of town equally stood its ground, in many cases forcing stockbroking analysts to upwardly revise forecasts and valuations. The overview table below (thanks Citi) shows growth expectations for the ASX200 ("the market") and for main sectors prior to the February season and after; it clearly shows expectations have pretty much risen across the board, and for both FY18 and FY19. This has been an observation highlighted by many an analyst post February, including Martin Currie Australia Chief Investment Officer (CIO) Reece Birtles, who has noted a higher degree of growth prospects suggested by many company CEOs during the season. Another shift from past seasons is that sales growth, rather than cost cutting, has now become the major driver behind this renewed growth optimism. -Given the market sell-off during February, and the ongoing macro uncertainty, analysts have not been as bullish when revising their models for future earnings growth, this suggests further upgrades going forward. Among individual stocks to perform well, Martin Currie highlighted JB Hi-Fi ((JBH)), IOOF ((IFL)), AGL Energy ((AGL)) and Fonterra ((FSF)). Analysts at Deutsche Bank who cover emerging companies selected the following five Top Picks: 3P Learning ((3PL)), Ausdrill ((ASL)), Cardno ((CDD)), Cleanaway Waste Management ((CWY)), and Seven Group Holdings ((SVW)). Macquarie analysts delved deeper into results updates by consumer stocks; a sector that generated quite a number of memorable "misses" throughout the season, but certainly also some fabulous "beats". Earnings throughout the sector are slowing in general terms, the analysts acknowledge, with Retail showing up as weaker than staples with downgrades for Harvey Norman, Automotive Holdings ((AHG)), Greencross ((GXL)) and Myer ((MYR)) weighing heavily. However, Macquarie analysts also believe now that share prices are weaker, investors are being compensated for related risks. While retail sales data have remained weak, Macquarie maintains overall consumption data have been OK, supported by the observation that consumers are still attracted to high quality physical offers. Macquarie's Key Ideas for the sector are Wesfarmers ((WES)), JB Hi-Fi and Coca-Cola Amatil ((CCL)) in a positive sense, and Woolworths ((WOW)) and Flight Centre ((FLT)) in a negative sense. Analysts at UBS identified three key themes for the consumer sector: consumer spending is softening, cost pressures are rising, and companies are busy preparing for the Amazon challenge. Post the February season, UBS analysts have turned less positive on the sector. UBS analysts see post-February opportunities in Flight Centre, Costa Group ((CGC)) and Treasury Wine Estates ((TWE)). Their Key Picks for the sector are Flight Centre, Woolworths and Costa Group, in a positive sense, and Myer and Coca-Cola Amatil in a negative sense. Macquarie also found the February reporting season for engineers and contractors turned into something of a mixed bag, as most companies delivered higher revenues but also weaker margins. Margins are expected to slightly rise, mainly because that's how the cycle for this sector unfolds, but the key challenge remains to keep costs tamed, say the analysts. The analysts are buyers on weakness, maintaining a positive sector outlook with the caveat that additional contract wins are necessary to justify today's share prices, even after recent weakness. The analysts see potential near term contract wins for Monadelphous ((MND)) and Cimic Group ((CIM)), but the best value proposition is considered to be Downer EDI ((DOW)). Elsewhere, Macquarie analysts seem delighted the infrastructure theme is playing according to script, becoming more and more important for the building sector in Australia. Stand-out sector results, in the analysts' opinion, have been delivered by James Hardie ((JHX)) and Reliance Worldwide ((RWC)), with nothing much to dislike. Apart from James Hardie and Reliance Worldwide, Macquarie also nominates Boral ((BLD)) as preferred sector exposure, even as Boral's update disappointed. The analysts suggest the issues behind that disappointment are improving. Deutsche Bank analysts have concluded the outlook improved for paper and packaging companies, despite Amcor ((AMC)) facing selling pressure post what the analysts believe was a report slightly better than expected. All three of Amcor, Orora ((ORA)) and Pact Group ((PGH)) are poised for underlying earnings growth, argue the analysts. Amcor and Pact Group are most preferred.